Great news for non iOS users, now they can use iMessage app on windows and enjoy the fast, specific features of iMessage app. Want to find out how a Non-Apple user can consume the advantages of iMessage app? By using Chrome Remote Desktop. By using the iPadian emulator. Most important things is you will need to have both a Mac with iMessage and the main, focused PC with windows. Moreover, installed Google Chrome in both computers is needed as well to use iMessage app on windows PC. On your Window PC and Mac download and install the app “Google Remote Desktop”. On your Mac computer go to Remote Desktop extension and write down the access code. Open Chrome Remote Desktop on your Windows. Enter the Code that you wrote down from your mac to provide access. Once you begin the connection, you will see a screen that shows your Mac Desktop. And then use your iMessage through the remote connection, as you do on Mac. Main thing is, In this process Mac should be turned on. Jailbreak simply means removing restrictions that are implemented by Apple on iOS. It roots the iPhone and after that we can download that application which was not allowed to be downloaded before. First of all you need to Jailbreak your Apple device by installing the software called Cydia. Cydia is a directory of applications that becomes functional because of your jail broken iOS device. After that you have to spend 4$ that is nearly Rs 280/- to get an app called Remote Messages in Cydia to set up a web based interface using your iPhone iPhone’s IP address found on the browser, following “:333”. It’s not that much complicated, By using this you’ll get to know everything and then you can access remotely iMessage on your windows PC. Then, Install .exe file in your PC. Continue by accepting the terms and condition. Search for “iMessage” in search bar. Download the Apple messenger app and launch it. 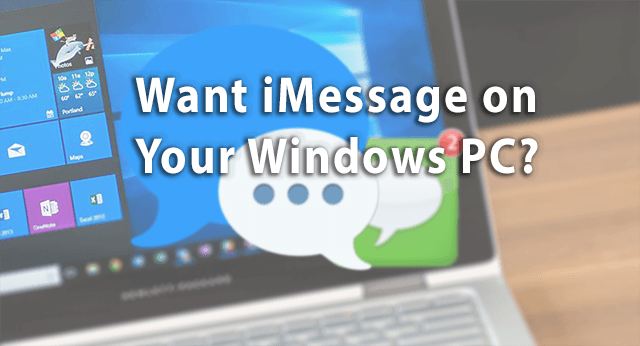 Now you can use iMessage on your windows computer. Contact us freely, if any queries occur at our gmail geektechinfo3@gmail.com or we respond as soon as possible at comment section too.